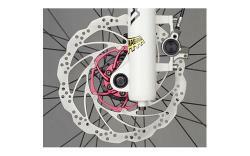 This is a Disc Brake that is suitable for all Mountain, Enduro, Cross Country, Tour and Freeride bikes. It is an open system, full hydraulic disc brake, with a reservoir, piston brake lever and twin callipers. The brake lever and calipers are made from die cast Aluminium and the caliper is postmount only (IS with adaptors). It is available with 160mm, 180mm and 203mm rotors.